Thanks to her film entitled Koundi et le jeudi national/Koundi and National Thursday, Cameroonian Ariane Astrid Atodji was an honor to her country. From 24 March to 5 April 2011, the 33rd Festival International des films documentaries was held at the Centre Pompidou in Paris. Unlike past years, the presence of African films was scarce at the Festival Cinéma du Réel. "We received very few African films” regrets Javier Packer-Comyn, the director of the Festival. “Productions are becoming increasingly rare. Other festivals in France put a great deal of effort into African cinema, but overall, African film production is diminishing.” A fortunate exception, Koundi et le jeudi national, by Ariane Astrid Atodji. the inhabitants agree to give a day of work per month to a collaborative project: a cocoa plantation. "This obvious sense of contentment in the village really struck me. I had not seen people like them in a long time. They were very satisfied with their situation; there was no complaining. I could definitely see that they would not die of hunger." 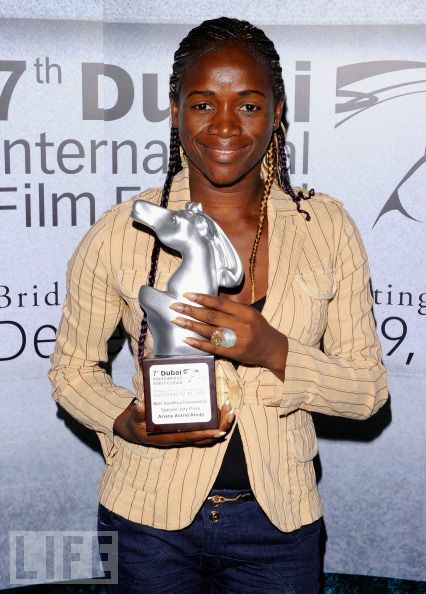 Born in Nguelemendouka, Ariane grew up in Cameroon and attended film workshops at the Goethe Institute in Yaoundé before studying at the LN International Film School of Yaoundé. At the Cinema du Réel she was able to produce and present Koundi and National Thursday. "There is no funding in Cameroon. I was very fortunate to find funding from the Goethe-Institut Kamerun. The question is what can the documentary bring to the Cameroonian society? "There is not a documentary film culture in Cameroon” says Ariane. "People are more interested in fiction. When making the film I had the non-Cameroonian public in mind, who are familiar with the documentary genre. Not only are there no longer cinema houses in Cameroon, but there is not an audience either, because people are not interested. They say: What is it, this documentary? What are we to make of it? Honestly, the idea of showing this film in theaters in Cameroon never occurred to me." Si l’Etat rompt le contrat de forêt communautaire, comment vivra Koundi? The State terminates the community forest contract, how will the village of Koundi live ? La forêt peut s’arrêter, mais pas le cacao! The forest can stop, but not the cocoa! like the new cocoa plantation. Le village de Koundi va profiter du cacao. The village of Koundi will benefit from the cocoa. aux travaux de ce champ! in working in the field! qu’on va dédier à ce travail. we will commit ourselves to this work. Ça sera le jeudi national! It will be National Thursday! Tout le monde doit participer avec joie! Everyone must participate with joy! Oh --- it does not work. The chief said that this Thursday! rendre au champ de cacao. go to the cocoa plantation. En français on dit: champ communautaire. In French we say community field. En maka c’est: Pombo cacao. In Maka it is : Pombo cocoa. Tous les hommes doivent y aller! Tout le monde doit aller au champ! everyone must to go to the field! No one should remain behind! tout le monde doit venir travailler! This Thursday will be a National Thursday"
everyone must come to work! Everyone must go to the field! avec leur machete au pied du lit! with their machete at the foot of the bed! Au cas où il n’y aurait plus de bois. in the event that there is no more wood.